Location. 32° 45.342′ N, 94° 20.762′ W. Marker is in Jefferson, Texas, in Marion County. 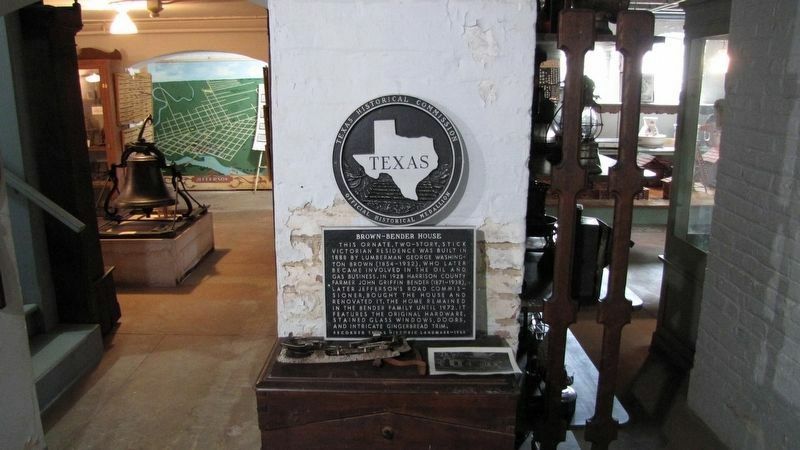 Marker can be reached from the intersection of West Austin Street and North Market Street. Touch for map. Marker is at or near this postal address: 223 W Austin St, Jefferson TX 75657, United States of America. Touch for directions. distance of this marker); Captain William Perry (within shouting distance of this marker); Excelsior House (within shouting distance of this marker); Jay Gould Railroad Car (within shouting distance of this marker); Jefferson C.S.A. (within shouting distance of this marker); Old Livery Stable (about 300 feet away, measured in a direct line); Early Jefferson Lodge Building (about 300 feet away). Touch for a list and map of all markers in Jefferson. More about this marker. The Brown-Bender House at 409 E Broadway was damaged by fire in August 2013. The marker is on display in the basement of the Jefferson History Museum. More. 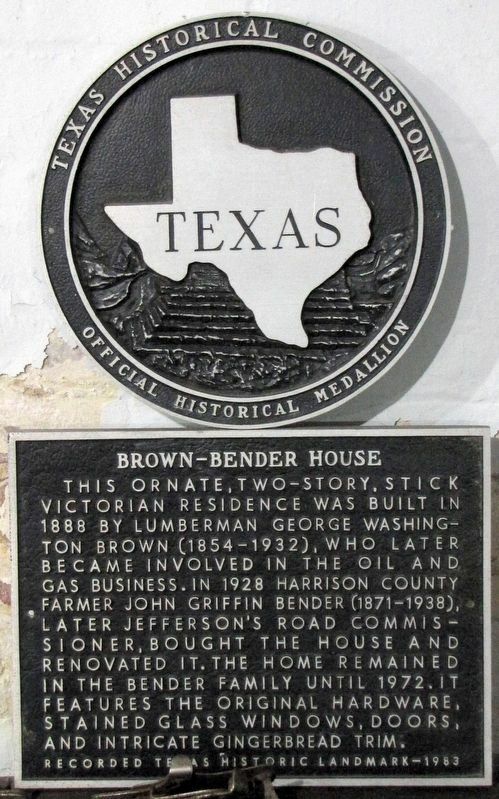 Search the internet for Brown-Bender House. Credits. This page was last revised on July 28, 2016. This page originally submitted on July 22, 2016, by QuesterMark of Fort Worth, Texas. This page has been viewed 251 times since then and 5 times this year. Photos: 1, 2. submitted on July 22, 2016, by QuesterMark of Fort Worth, Texas. • Bernard Fisher was the editor who published this page.